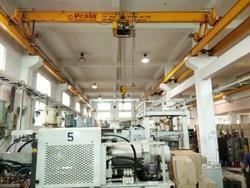 Overhead cranes are commonly used in therefinement of steeland other metals such as copper and aluminium. At every step of the manufacturing process, until it leaves a factory as a finished product, metal is handled by an overhead crane. Raw materials are poured into afurnaceby crane, hot metal is then rolled to specific thickness andtemperedorannealed, and then stored by an overhead crane for cooling, the finished coils are lifted and loaded onto trucks and trains by overhead crane, and thefabricatoror stamper uses an overhead crane to handle the steel in his factory. Theautomobileindustry uses overhead cranes to handle raw materials. Smallerworkstationcranes, such asjib cranesorgantry cranes, handle lighter loads in a work area, such asCNCmill or saw. Span 3 - 30 (Mtrs). We are a renowned name in manufacturing, supplying and exporting a ruggedly constructed range of Double Girder Box type EOT Crane. These cranes possess a load bearing capacity up to 100 T along with spans up to 50 M. We use advanced techniques in our manufacturing procedure, which enables us to keep in pace with the existing market developments. 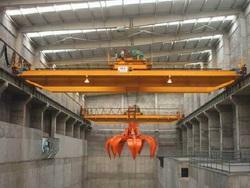 Our range of Double Girder Box type EOT Crane is available at industry specific rates. Optimum design of the structure avoiding dead weight and reducing the cost of the equipment.Very much suitable for power house cranes where these cranes are used for maintenance.Economical Design by providing manual long and cross travel facility with a provision for using either an electric hoist or a motorized chain pulley blockLow head room which in turn reduces the cost of the shed/buildingCustomized design to match the budget of the customerHighly Competitive Price. Our company is reckoned for its ability of manufacturing, supplying and exporting a sturdily constructed range of Double Girder EOT Cranes. Optimum quality raw material such as MS angles, Ms Sheets, motors, I beam and brakes are used to manufacture these Double Girder EOT Cranes. Our range can be customized according to the demands of our valuable clients. Limit Switches: To prevent over hoisting & over lowering of hook.Push Button Stations: Extra light, handling, easy to operate, aluminum, fabricated from extruded section.Soft Starts Electric / Electronic soft start modules electrically coupled to the long travel drives to achieve jerk free, cushioned & smooth starts. Lift 0.5 Mtrs. To 35 Mtrs. Being a leading name of the industry, we are recognized for our ability of manufacturing, supplying and exporting a ruggedly constructed range of Double Girder I Beam type EOT Crane. These cranes possess a load bearing capacity up to 100 T along with spans up to 50 M. We use advanced techniques in our manufacturing procedure, which enables us to keep in pace with the existing market developments. Our range of Double Girder I Beam type EOT Crane is available at industry specific rates. 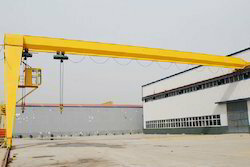 We are manufacturer and supplier of Material Handling Cranes. We are offering a quality range of Jib Crane to the esteemed customers. Our range of Jib Crane is made available in different models, capacities and other specifications to cater to varied clients' requirements. Being a leading name of the industry, we are recognized for our ability of manufacturing, supplying and exporting a ruggedly constructed range of EOT Cranes. Grab cranes are used mainly in Cement, Coal, and Fertilizer Handling Industries and to a extent steel manufacturing industry also. Grab buckets in India are Motorized, 4 rope type synchronized with smooth hoisting, opening and closing of Buckets, which helps in achieving High Productivity. Grabbing cranes are specially designed as per class IV, IS 3177(1999)/807 continuous duty. These cranes are designed as per customer requirements only. We are industry’s most reliable and economical source for qualitative products and thus been a known name for offering products. We provide a wide range of Electric EOT Crane which is manufactured by using premium raw material that is procured from quality driven industries. Being a leading name of the industry, we are reckoned for manufacturing, supplying and exporting an industrial specific range of Single Girder I- Beam Crane. Due to their outstanding quality and features, our products have found their large application in machine shop, foundry and engineering sections of industries. Besides, we provide customization solutions, which are according to the specific demands of our valuable clientele. Design : Compact dimensions, low weight, easy to operate and easy to maintain. Motors : Motors will be Crane duty motors, squirral cage induction motors for hoists and cranes also slipering induction motors will be provided for heavy duty cranes as per the applications. Gear Boxes :Precision flat helical / spur gear units in light alloy housings with case-hardened gears, high-grade surface treatment and permanent oil /grease lubrication. Brakes : Single / Dual-disc Electro Magnetic DC Brakes featuring automatic braking on power failure. Push Button Stations : Extra light, handling, easy to operate, aluminum, fabricated from extruded section. We are industry’s most reliable and economical source for qualitative products and thus been a known name for offering products. We provide a wide Double Beam EOT Crane which is manufactured by using premium raw material that is procured from quality driven industries. Our company is reckoned for its ability of manufacturing, supplying and exporting a sturdily constructed range of Single Girder Box type EOT Crane. Optimum quality raw material such as MS angles, Ms Sheets, motors, I beam and brakes are used to manufacture these Single Girder Box type EOT Cranes. Our range can be customized according to the demands of our valuable clients. Limit Switches: To prevent over hoisting & over lowering of hook. Push Button Stations: Extra light, handling, easy to operate, aluminum, fabricated from extruded section. Soft Starts Electric / Electronic soft start modules electrically coupled to the long travel drives to achieve jerk free, cushioned & smooth starts.